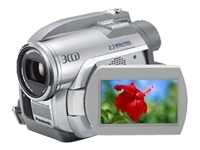 e.cam are a range of digital video cameras from Panasonic, which do more than just take great pictures. With a host of digital capabilities, these cameras give you entirely new ways to enjoy the images that you capture and expand your possibilities for more creative visual communications. Index screen for simple searching: Quick Search & Access with Disc Navigator.